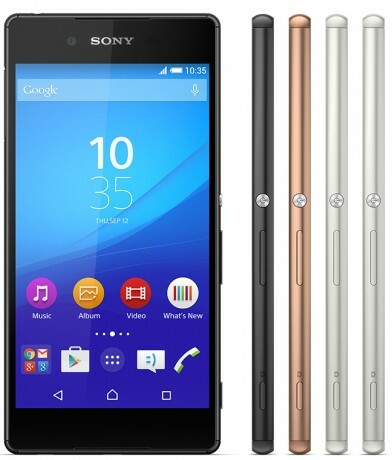 Sony today announced the Xperia Z3+, which is essentially a global version of the Z4. Sony debuted the Z4, limited to Japan, earlier this year. The Z3+ features a glass and metal design that is water and dust proof, and measures 6.9mm thick. The Z3+ has a 5.2-inch full HD Triluminos display and runs a 64-bit, octa-core Snapdragon 810 processor with 3 GB of memory, 32 GB of storage, and Adreno 430 graphics. The Z3+ supports memory cards up to 128 GB. The main camera relies on Sony's 20.7-megapixel Exmor RS sensor, while the front camera uses a 5.1-megapixel Exmor sensor with shake correction. The main camera can record video up to 4K, while the front camera can record 1080p HD. The Z3+ offers a range of connectivity options, including dual-band WiFi, Bluetooth 4.1, NFC, and support for LTE 4G networks. The battery has a maximum capacity of 2,930mAh, but Sony says it is good for two days of battery life. The device runs Android 5.0 Lollipop and will feature Sony's apps and user interface overlay. Sony said it will begin to sell the Xperia Z4 in Japan around the middle of the year, but didn't say when the Z3+ might reach the rest of the world. U.S.-based network operators have yet to voice support for the Z3+. T-Mobile was the only carrier to sell the Xperia Z3. Sony today said a limited number of people can download and install its concept user interface for Android 6.0 Marshmallow on either the Xperia Z3 or Z3 Compact. Sony says the concept is rolling out slowly over the coming weeks and will be updated over time with new features and experiences. Google today added the Sony Xperia Z3 to the list of devices able to download and test the Android N Preview. Z3 owners can obtain the Android N Developer Preview 2 code directly from Sony, but will have to manually flash it to their device.